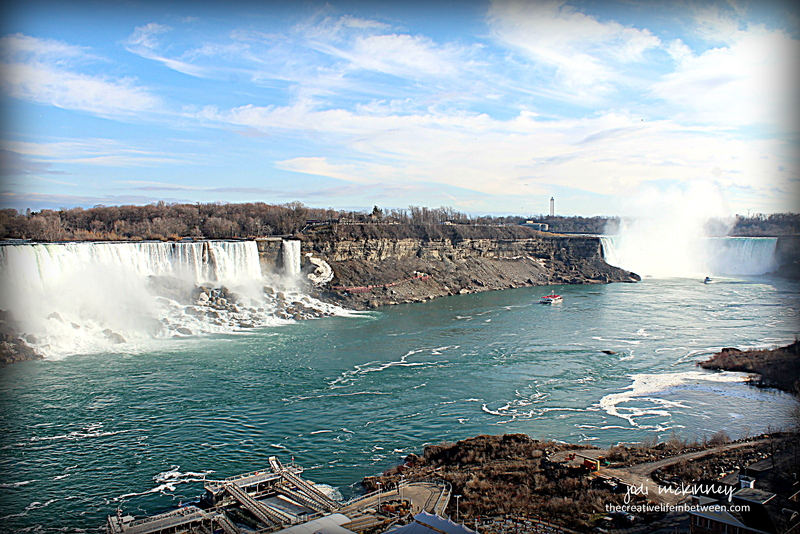 Niagara Falls: A Great Weekend Getaway. Hubby suggested Niagara Falls to celebrate our 35th wedding anniversary. 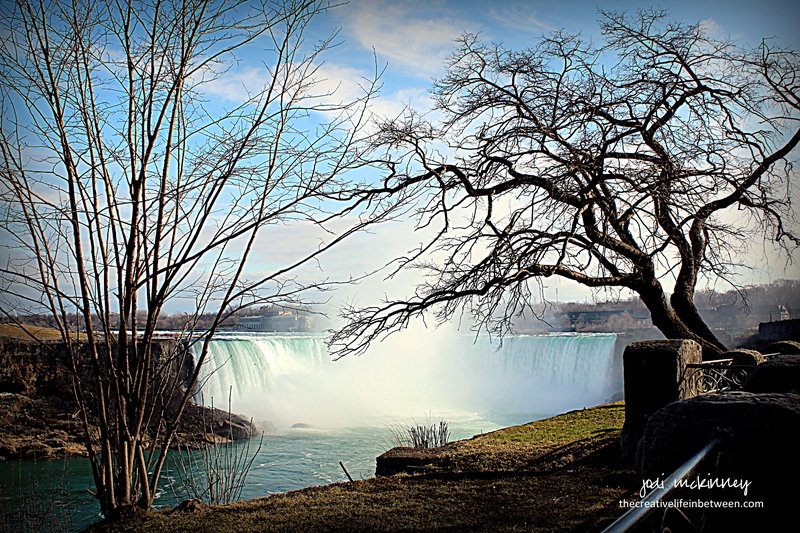 Niagara Falls is truly a natural wonder to experience! We are fortunate it is only a 3 1/2 hour drive from our little town of Mars. Located on the Niagara River, which drains Lake Erie into Lake Ontario, the combined falls form the highest flow rate of any waterfall in the world that has a vertical drop of more than 165 feet (50 m). 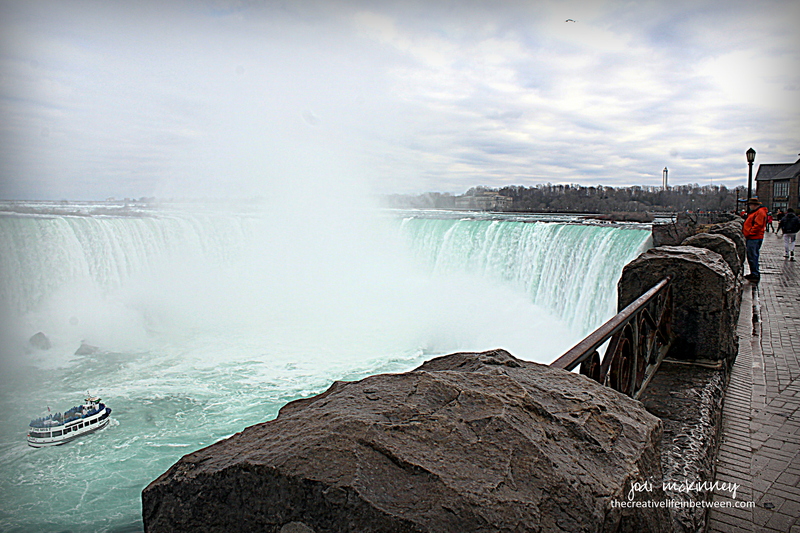 Horseshoe Falls is the most powerful waterfall in North America, as measured by vertical height and flow rate. We had fun visiting both the U.S. and Canadian side of the falls (a passport is necessary to travel between the two). It was a bit chilly in early April, but so worth it to avoid crowds! We visited early morning when the mist was heavy on the “American Side.” We walked the path along the “Canadian Side” during the afternoon when the sun broke through the clouds. 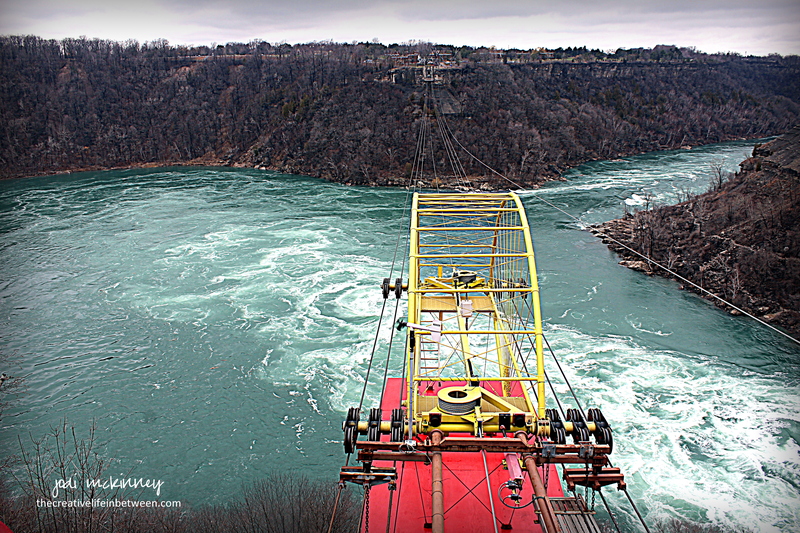 A highlight to experience (which we did) is riding the Aero Car, suspended by cables, over the Niagara Whirlpool. The Whirlpool is formed at the end of the rapids where the gorge turns abruptly counterclockwise and the river escapes through the narrowest channel in the gorge. A visit to Niagara on the Lake is another highlight, with quaint shoppes and wonderful wineries that host pairings and tastings. 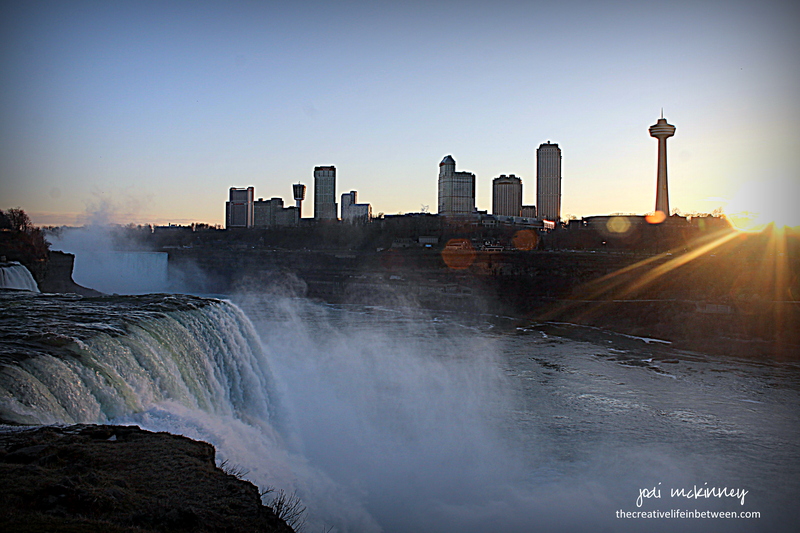 It was wonderful to head back to the U.S. side and experience the Falls at sunset before heading for dinner. And after dinner, another visit to see the falls lit up at night. Niagara Falls is a great weekend getaway, with something for everyone – including casinos and wax museums and boat rides and cave tours. This is not our first visit, so we’ve experienced some of the others previously. There is something so beautiful and special and even a bit romantic about Niagara Falls. Thanks to our guys for “kicking us out” so we could have such a great getaway weekend! Thanks Mary! I hope you do get there, it is truly a magnificent sight to behold. Nature in its most extraordinary way! Thanks Debi – it is truly a sight to behold. Have you ever been there? no, my daughter has been and loved it!! What a wonderful, lovely place to choose to go to celebrate your anniversary! Love the powerful sound of the water and just watching them. Speaks to the soul. We did not this time. It was a bit cold, and I’d rather just watch them from a distance. 🙂 We have gone down under them on tours in the past, and it is very interesting. They are so amazing to just be by – eh? I could be there all day. Especially this time of year when there really are no crowds to speak of. One with nature. Peaceful and romantic :). Have you been there Kathy? We sure did. Thanks chiela! It is so stunningly beautiful in real life. Hard to capture. Glad you got to experience it Cheryl! Have you ever been there terry? What a stunning place to visit – I would love to go someday… ! It is so stunningly amazing. Hope you get there someday Evelyn! I enjoyed the tour you gave us because I have never been there. The pictures are just beautiful and the night picture is stunning! What a wonderful anniversary getaway for you and Marty! I hope your house was still in good shape when you got back home. LOL! Thanks pj. Glad you enjoyed. House was in great shape. A couple extra beers in fridge and lingering cigar smell in the garage is all we came home too. A bunch of great guys. We are very blessed. Yes! You certainly are blessed! I think it is great that your house was in good shape when ya’ll got home. That was nice of them to only smoke in the garage! I wondered how far away you and ray might’ve been. Will do!! Such a fun area to explore Jodi. It has been awhile since we visited the actual falls but we have been to Niagara-on-the-Lake a number of times over the years. Love the area! I love it at Niagra! Good memories from being a little girl! Thanks for the awesome pics! Mom and Dad celebrated their honeymoon there… 65 years ago on the 26th! Happy Belated Anniversary! What a great way to celebrate! Very beautiful photos! Thanks Lynn. Have you ever been there? I have not! It looks amazing Jodi! So glad to welcome you and Marty to this side of the border! Glad you enjoyed Niagara Falls, the honeymoon capital of Canada. Love Niagara Falls and Niagara on the Lake. Such a beautiful area. Very glad you had a good time. Thanks Sylvia. It is so beautiful. Wow! Such gorgeous photographs, Jodi. My two favorites were the dramatic ones of stunning sunset and evening with colored backlighting! Amazing. I would love to see the falls some day. I hope you do someday – and I still SOOO want to get to Ireland too! I would love to go there, the photos are really amazing! I hope you can sometime! What a perfect getaway for your anniversary! 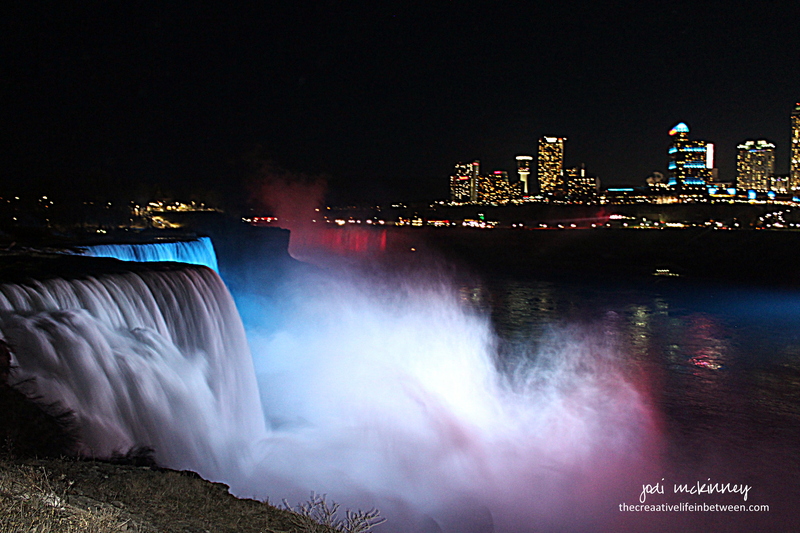 I had no idea they lit up the falls like that at night, I must live under a rock, ha! Gorgeous photos. Looks like a wonderful weekend trip! I’ve never been to Niagara Falls, but I really hope to get there some day. Thanks for the photos! I hope you do too, Ann. It really is something to experience in person! What a wonderful place to celebrate your 35 yrs together! It’s been 34 yrs since I visited Niagra Falls! No passport necessary back then. I didn’t see it at night then. WOW, it’s gorgeous at night too. I don’t recall seeing that aerocar ride over the falls to see the whirlpool. That would be a cool view! Thanks for the memories, and for sharing your lovely anniversary trip. Happy Anniversay once again, Jodi. Glad you had a great time.